Q: What’s your best piece of advice for readers looking to improve their marketing? Everyone has an incredibly unique value that makes them stand out in the world, that’s your personal brand. With just a small amount of consistency and focus, your personal brand can tell the world about your passions, expertise, humanity and the value you can provide. Building a brand that accelerates your career is what we call your Road to Recognition. The most valuable thing you can learn from this book is that you are in the driver’s seat of the brand called you and that brand is crucial to your success in the age of digital media. Q: What was the inspiration for The Road to Recognition? We are living in unprecedented times. Every day billions of pieces of content are published on Facebook, Instagram, Pinterest, Snapchat and other platforms like clockwork. Our attention spans are getting shorter by the minute. Tenure at work is basically a thing of the past. In this age of digital distraction and information overload, recognition is the biggest professional challenge we face. We don’t just need exceptional skills, we need ways to clearly articulate what we do, why we do it, and why anyone should care. My co-author, Barry Feldman & I discovered personal branding almost by accident, in building our own careers. Over time, we found that the more we focused on refining our UVP (unique value proposition) and leveraging opportunities to share our expertise with broader audiences, the more control we had over our professional destiny. This discovery led us to research the strategies and tactics accomplished personal branders use to accelerate their careers. We had read countless books on personal branding theory geared towards marketing geeks. We felt like the world has had enough of that. This book was written as an easily accessible guidebook for people like you and me. Whether you’re an entrepreneur, executive, aspiring professional, consultant, artist, designer, chef, or retiree, you are a brand with a reputation to be recognized, and there is no reason to leave that to others’ control. Q: What is the key concept behind The Road to Recognition? Being avid content marketers made us hyper-aware of the fact that people have short attention-spans. We wanted to create a modern reference guide for personal branding that was easily digestible and visually compelling. So we focused on creating a framework for the the book first. We settled on A-Z because of its familiarity and because personal branding is comprised of interconnected tactics and strategies that don’t have to be employed all at once. We were fortunate in that we had already tested the A-Z concept with a series of highly successful infographics and slideshares on the topic. Most notably, The A-Z Guide to Personal Branding which went viral when we first published it in 2014. But just because the chapters follow an accessible A-B-C format, we didn’t want to oversimplify some rather complicated concepts. We wanted to take those concepts and describe them in a conversational tone while outlining clearly actionable ideas. Anything other than the real you won’t do. Discover exactly what makes you fascinating. Build your brand on your true strengths. The most important personal branding development in the age of digital media is the power to publish at will and express your ideas. You need to start a blog and keep building on it. Valuable content has magnetic power. On your blog—or in addition to it — create an interesting mix of content in various formats to earn the mindshare and trust your brand needs. Everything you create should be presented with class and continuity. Develop a tasty logo, color palette, and design standards that reflect well on your brand. Each chapter feeds and supports all the others throughout the entire alphabet, A to Z. The book didn’t come together overnight. In fact, it took us over two years, with massive amounts of editing along the way. It’s been a journey of perseverance and research filled with fits and starts. For example, about 12 months into the writing process, we realized that the chapters we wrote when we started, needed to be re-written to have a consistent tone and voice. Writing The Road to Recognition was a labor of love from the start. And we were committed to creating a book that would add value to the reader whether they read one chapter or all 26. We wrote this book for our friends, readers, listeners and fans, who aren’t necessarily professional marketers, but who definitely need to market themselves professionally. When it comes to building your brand, it’s a jungle out there. Between blogging, social media, networking, websites, content marketing, landing pages, email, and PR, there’s so much to manage in today’s always-on, always-connected universe. The key to making personal branding work in today’s digital economy is the right playbook and aligning it with your professional goals. To that end, The Road to Recognition is a path well worn and easily followed. There are so many great examples to follow. 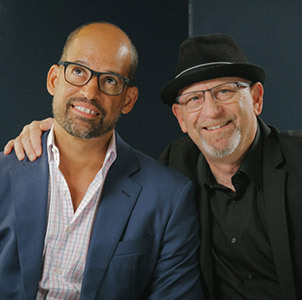 We intentionally sought out original contributions in each chapter from successful personal branders like: Brian Clark, Bryan Kramer, Chris Brogan, Dan Schawbel, Dorie Clark, Doug Kessler, Erica Nicole, Frederick Townes, Ian Altman, Jason Miller, Jay Baer, Jeff Bullas, Jill Rowley, Joanna Wiebe, Joe Pulizzi, John Jantsch, John Lee Dumas, Karen Kang, Kim Garst, Lee Odden, Marcus Sheridan, Mark Traphagen, Michael Port, Navid Moazzez, Richard Moross, Robert Rose, Scott Abel, Scott Stratten, Stephanie Sammons, Sujan Patel, Ted Rubin, Tom Peters, & Vanessa DiMauro. Personal branding is not about creating fame. Successful personal branding is the act of sharing your expertise with the world in a way that adds value to the audience that matters to you. Q: How do you describe yourself professionally? I’ve had the opportunity to work in every kind of go to market job, whether it’s big business or small. I’ve had the ability to scale companies from the first customer to the first one hundred thousand and I’ve worked in industries like hospitality, privacy, technology, retail and real estate. As a personal brand expert I love helping people find their voice. I love them being recognized for the ideas they have so that they can scale their business that much faster. I am absolutely obsessed about helping people do that. What’s interesting is I have the ability to step into the shoes of each participant from a go to market perspective. The challenges that my clients say most often, is that they really want their customers to start noticing them. They want to get attention for their business. They want the team to understand the vision and ultimately they want to raise the visibility of the brand. I fix that. Because when I get hired to be a keynote speaker, I bring a combination of inspiration and also tactical strategies an audience can implement immediately that will position them like no other. You see, the reason I do what I do, is that I feel like I’m surrounded by all these amazing people with incredible talents and ideas, and yet they don’t know how to bring them to the world. My life’s mission is to fix that. Q: What are 1-3 books that inspired your work/career? I remember reading Robert Heinlein’s Stranger in a Strange Land repeatedly, I think I read that book at least 10 times. It was the first time that I realized that everyone was simultaneously unique and the same. Their own special snowflake, trying to communicate with and understand the world around them. To this day, I value empathy as one of the greatest emotional sensitivities a human can have. I was not a great student in school, but I was a voracious reader. As a writer, I handed in the required writing for each class and wrote the occasional poem. But it wasn’t until I read Anne Lamott’s Bird by Bird: Some Instructions on Writing and Life, that the passion for writing firmly entered my life. That book made me fall in love with the written word and it’s ability to tell stories and move people. I moved a lot as a kid and often found the bookshelves around me filled with random books of the time. Dale Carnegie’s How to Win Friend and Influence People, was one of those books. Who doesn’t want to understand how to influence people. I remember reading this book and testing out the theories on my teachers and fellow students. I distinctly recall looking my history teacher in the the eye and saying his name to thank him for helping me. I’m not sure if that had anything to do with my A+ grade in that class, but i have to imagine that my friendship with him was solidified by my new found willingness to care about his well being. Q: What’s something unusual or fun that most people don’t know about you? I was a professional chef in NYC during my early 20’s. It was an amazing experience that still lives with me to this day. One of my favorites pastimes is shopping for cookbooks and cooking gear. I cook almost every night when I’m home, making elaborate meals for friends, family or a little tasty treat for my wife. The kitchen is my happy place. Everything I love about food and wine without any of the responsibility of running a restaurant. Q: Is there a piece of marketing content that you’re particularly proud of? 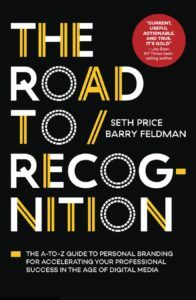 I’m extremely pleased with the design and marketing for The Road to Recognition. We approached the book much like launching a product. We focused on identifying the personas who would most benefit from the book, settled on a color palate, and even designed a custom alphabet to represent each chapter, A-Z. This has allowed us to extend the content of the book to keynotes presentations, workbooks,, infographics, slideshares, ebooks, t-shirts, hats, mugs, cards and a tote-bag. Q: Is there anything else that we haven’t covered that you’d like to share? Everyone can benefit from a strong personal brand, No matter what you do, you can take steps to make people think of you when they think of your field. Thank you Seth & Barry.